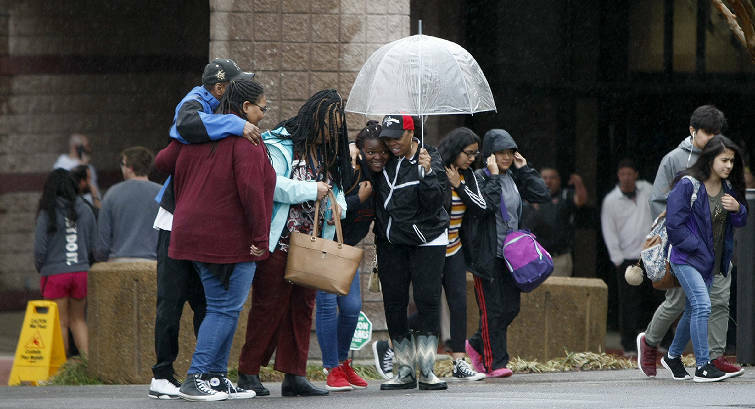 People hug one another outside of the Dalton Convention Center on Wednesday, Feb. 28, 2018 in Dalton, Ga. Students from Dalton High School were evacuated to the Dalton Convention Center after social studies teacher Randal Davidson allegedly barricaded himself in a classroom and fired a handgun. Former Dalton (Ga.) High School teacher Jesse Randal Davidson, who fired a handgun out his classroom window in February, pleaded guilty Tuesday to first-degree criminal damage to property, carrying a weapon within a school safety zone and disrupting the operation of a public school. Because the first two charges are felonies, Davidson was sentenced to serve two years in prison followed by eight years on probation, according to a news release. Also, he is to concurrently serve 12 months on the final charge, which is a misdemeanor. Davidson, 53, was arrested on Feb. 28 after he fired a .38 out his window. The only physical injury resulting from the incident was a twisted ankle suffered by a student during an evacuation. 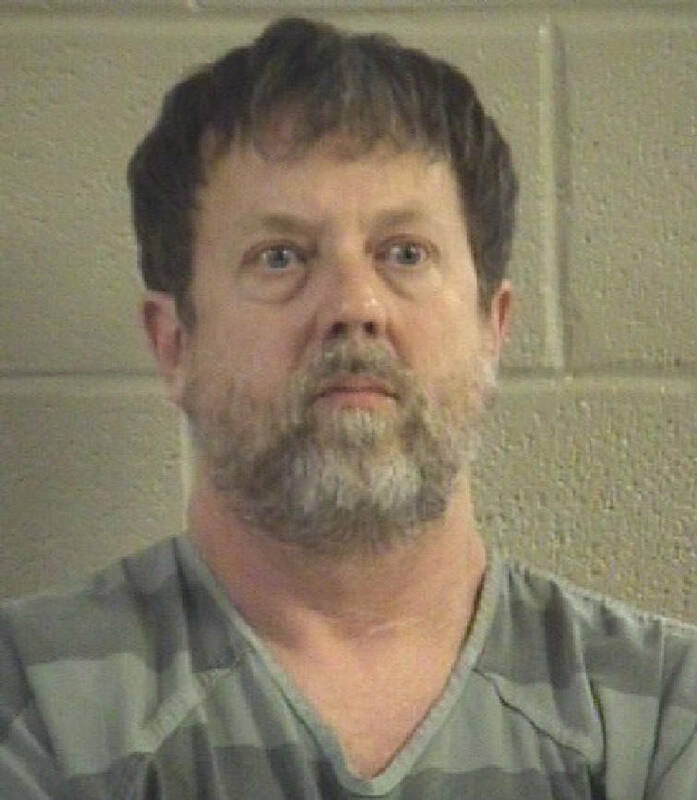 Investigators said Davidson sneaked the gun into school in his computer bag, taught his first period social studies class and then locked the door during his planning period. When the period was up, students tried to get inside for the next class. Principal Steve Bartoo unlocked the door, he said, but Davidson yelled something and shut it again. He then fired a shot out the window. Administrators put the classrooms into a lockdown, during which students turned off the lights and barricaded themselves behind stacks of desks. Davidson turned himself in after officers responded to the school. Conditions of Davidson's probation include a $1,000 fine, 100 hours of community service, a probation supervision fee and restitution totaling $16,133.97, the news release states. Davidson has cooperated with law enforcement, Conasauga Judicial Circuit District Attorney Bert Poston said. His attorney, Richard Murray, indicated from the very beginning that his client would be entering a guilty plea and taking responsibility for his actions. Before that plea could occur, however, a series of meetings were held between officials with the district attorney's office and Dalton High School to establish communication protocols, discuss possible criminal charges and a negotiated plea, according to the news release. All parties were in agreement about the final terms of the plea agreement, and Principal Bartoo spoke at the sentencing in support of the agreement. "The case posed entirely new challenges to the District Attorney's Office and Victim/Witness Assistance Program because of the number of victims involved," Poston wrote, noting there were about 1,900 students involved, in addition to their parents, family, teachers and school staff. Several people wrote letters and provided victim-impact statements to the court. "There was no way to meet with each victim individually, but every effort was made to ensure that any person wishing to be heard or to have a voice in the process was provided that opportunity," Poston wrote.